Military Appreciation Day always makes a Clemson home game so special. I still get chills during the military fly over. And watching Clemson walk on and military vet Daniel Rodriguez lead the team down the hill was such a great moment. And we lost count of how many times the student section chanted "U-S-A!". 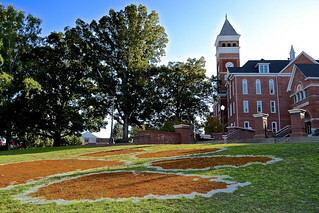 You will see lots of Clemson pride and pride in our country in our gameday photos this week. The football game started out a little sloppy, but the Tigers came back in full force with interceptions, great plays and...of course...touchdowns! Final score -- Clemson 38, Virginia Tech 17. You can view our gameday photos in the slideshow below or on our Flickr site. Do you have photos from Saturday's Clemson game you would like to share in this album? Email them to us at clemsongirlblog@gmail.com. Special thanks as always to our volunteer gameday photographers - if you're interested in taking photos for ClemsonGirl.com at a future Clemson home game, email us at clemsongirlblog@gmail.com. Such a great game! I am glad the weather is cooling down, making it the perfect football weather!